Fought over bitterly cold flecks of rock and tundra scattered across the remote waters marking the boundary between the Bering Sea and the Pacific Ocean, the Aleutian Islands campaign represented one of the strangest encounters of World War II. Curving southwestward from the southwest coast of Alaska like the tail of a stingray, the rugged, volcanic Aleutians belong to both the United States and Russia. The westernmost island, Attu, lies much closer to Russia's Kamchatka Peninsula than to Alaska; the distance to Anchorage, Alaska measures approximately 2,000 miles. The moral impact of the Doolittle Raid in response to Pearl Harbor far outweighed the relatively minor material damage it inflicted; Japan lost face and the faith of its people in ultimate victory declined sharply. Americans responded with delight and a fresh upsurge of hope. Despite interrogating the eight American aircrew they captured (and butchering tens of thousands of Chinese civilians in reprisal for assisting the rest in their escape), the Japanese leadership remained divided in their opinions about the bombers' origin. Many believed that the Americans had indeed devised a method of launching such large aircraft from an ordinary aircraft carrier. Many others, however, insisted the B-25s came from a land base, and only the Aleutians lay within a medium bomber's operational range. In any case, Admiral Yamamoto Isoroku planned a move against Midway. Attacking the Aleutians provided an excellent diversion, in his opinion, permitting him time to take Midway and organize land-based strike aircraft there. He could then take his carriers to annihilate America's Pacific Fleet, caught between the Aleutian Islands and Midway. Due to the belief that the Aleutian Islands might support the airfields from which the Doolittle bombers launched, Navy Order Eighteen from Imperial general HQ included a section decreeing “the invasion and occupation of the western Aleutians... in order to prevent enemy forces from attacking the homeland” (Garfield, 1978, 7). In the event, the secondary operation to the Aleutian Islands proved more successful than the main thrust at Midway Island. In a triumph of cryptanalytic skill and poker-player daring, codebreaker Joseph Rochefort and his team at “Hypo” cracked Japanese messages proving the main effort aimed at Midway. The U.S. Navy intercepted Yamamoto's fleet at Midway and smashed its carriers in one of the most decisive actions of the Pacific Theater on June 3rd to 7th, 1942. The Aleutians invasion, on the other hand, gave Japan a foothold on American territory that required almost a year to dislodge. In the end, however, by one of the ironies of war, the Japanese attempt to prevent land-based bombers from striking at Japan from the Aleutians backfired. Once the U.S. Army finally evicted the IJA from the islands, the Americans built considerably larger airfields there, from which regular sorties struck the Japanese-held Kurile Islands and shipping along the northern Japanese coast. 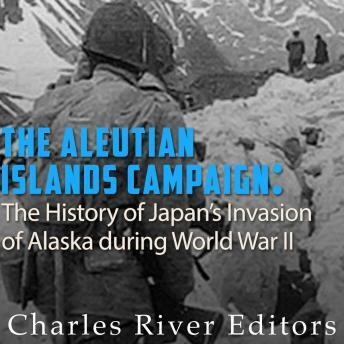 The Aleutian Islands Campaign: The History of Japan’s Invasion of Alaska during World War II chronicles one of the most famous and unique campaigns in the Pacific.